Anamika Mishra is a young writer with several very inspiring and thought provoking quotes. As a published author Anamika Mishra made her debut with the novel Too Hard to Handle (2013); this was followed by several other publications, the most recent being the novel Voicemates. 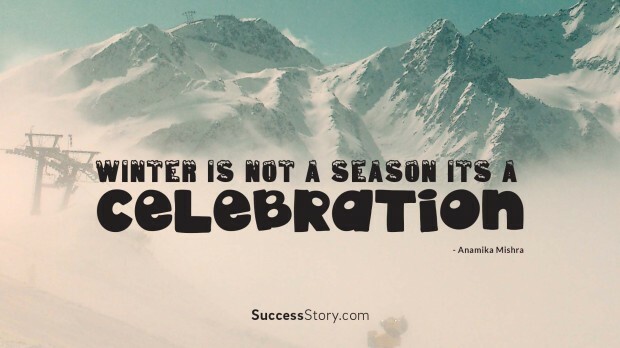 "Winter is not a season, it's a celebration "
Though a relatively young lady, Anamika Mishra has a lot of to offer Indian and the world. She is the holder of a Master’s Degree in Journalism and Mass communication. However, it would appear that writing is her first passion given the number of books she has published since her first novel. In addition to this, Anamika also loves travelling and photography. Her passion for the pen and paper started while she was still in school where she posted many articles for the school magazine. She has an inspiring attitude as reflected in one of her quotes; I am striving to reach the epitome of perfection and I am certain I will achieve this dream someday. Anamika Mishra is a fiery author and this often comes across in her quotes that bear both a lot of passion and reflect her firm stance. She is known to have strong opinions on issues and comes across with lots of passion in defense of her beliefs. However, this should not be taken to suggest lack of tact as she is known to be very witty, cheerful and humorous. Owing to her alluring persona she is a favorite among the youth in India. She often conveys an attitude on the virtues of positive thought and patience in her quotes and books. Anamika is also a popular blogger and article writer who has produced many inspiring writings loved by many people from all parts of the world.